It has been a longish winter for the Hope Valley Under 10s – the lad’s team. In the year before we formally start keeping scores (but do anyway) a couple of wins punctuating a larger number of losses, including a couple of heavy ones, have added lead to some legs. 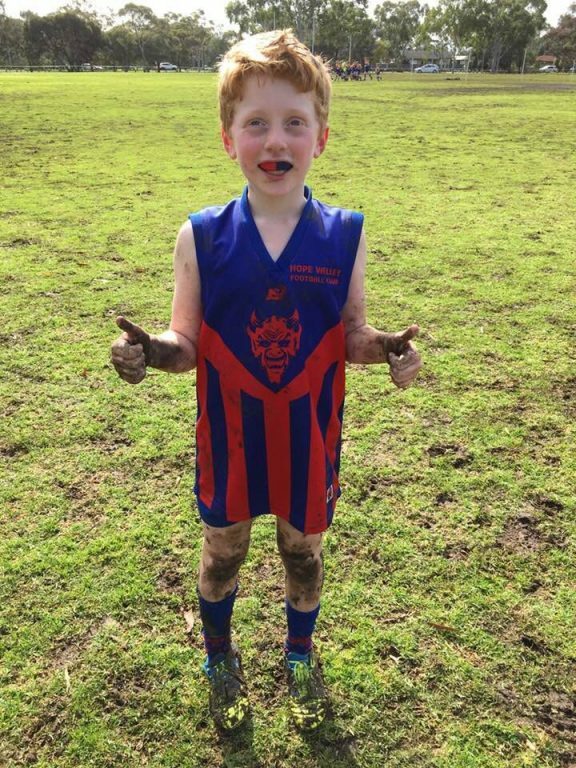 Junior footy is all about having fun but, let’s face it, it’s funnest when you’re winning. We have been working hard (I move the magnets around the board in my capacity as Assistant Coach). 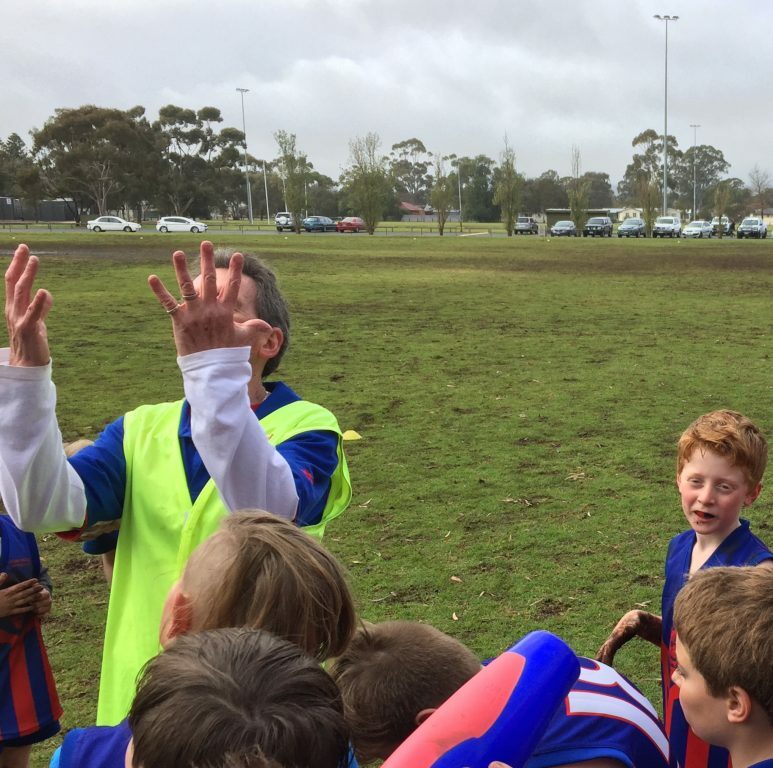 Training twice a week, weather permitting, and through the school holidays, our focus has largely been around winning the contested footy – overcoming shyness and reticence to go after that pill. The young demons may not be taller or more gifted than our opposition but they can work harder and be more desperate at the ball. The boys are getting there but have gone largely unrewarded thus far this season. So, enter the penultimate Sunday of the junior football year. Adelaide has received a fair lashing of rain over the last week, causing both of our training sessions to be cancelled but our oval, centre square excepted, is still in pretty good condition. As the tyres crunch the gravel at Argana Park in Elizabeth, their oval tells a different tale. Waves of mud, tonnes of the sloppy brown stuff, still fresh and moist are within the boundaries marked for us. The lad’s eyes light up – he’s out the door and running through the thickest of it almost before the car stops moving. It’s by far the worst ground we’ve played on this winter but he couldn’t be happier. As teammates filter out of reluctant parental cars, it’s clear he is not alone. Boys chase each other around the mud like a pack of seagulls with a single chip in their midst. A light squall blows across the ground and the coach’s instructions are simple – get to the ball first and get it forward, nothing fancy; play in front at all times. His charges respond, hitting the deck harder than a Starc bouncer. In the slip and the slop, a season of imploring the team to go and get the ball finally pays dividends, as the Demons are first to it and dominate the first quarter. When he’s not at the bottom of the pack, the lad is getting in front of the play and providing a link as we win it forward. His kicking, in previous years a real weapon, is back to its best, repeatedly putting the ball to advantage. His sure footedness in the same conditions that slow his opponents provides a noticeable advantage. Despite dominating the quarter, Hope Valley don’t quite get the score on the board in the first quarter, kicking 1.3 to 0.1. The second quarter starts much the same way, the ball locked in the Demons’ forward line without actually going through the big little sticks. Contest after contest players squirm in and out of the mud, getting pressed and pressing in equal measure. Eventually the weight of possession takes its toll and the boys go into their oranges (very difficult to eat with mud-coated hands) well ahead. Micro showers fall and pass and things only get more slippery. The mudlarks scrimmage the ball forward and a few more goals ensue. The umpire is just what the game needs: he’s generous with his call of mark; he pulls out a free to the defending side when things are getting too congested; and as the game flows even more in our favour he errs on the side of the opposition to make sure everyone gets a kick, much to our boys’ chagrin. The lad, now almost covered head to toe in mud, sneaks forward and milks an in the back free kick (entirely uncoached but he is highly proficient). He goes back and kicks his second goal for the season, rather pleased with himself. He then returns to testing out every bit of mud on the ground for consistency and quality. Certainly, the winning helps but it is the conditions he is enjoying just as much. By game’s end, a 59 point win, the boys enthusiastically sing the song, arm in browned arm. I think they needed a day like this, and equally so did those of us on coaching and parental duties; small but proud. Car interiors, less so. So, here’s to mud. Long gone are the days where elite footballers would occasionally be forced to slog it out in suburban quagmires, and in many ways the game is less rich for it. One of the attractive features of Australian Rules is that it can accommodate so many shapes and sizes. But with increasing professionalism this is increasingly not the case. Something like one in 30 young Australian men are taller than 190cm but in the AFL 40% are – fewer shapes, fewer sizes. The homogenisation of conditions along with expansion of the interchange has created a game increasingly for the genetically gifted: the tall, the fast, the aerobically odd. Maybe a few rounds in the mud would create a way back in for the skilfully slow, the unsophisticated but desperate. You could even, at random, truck a few tonnes in for games at the Docklands to keep life interesting. Homogenisation will always lead to defensive innovation ahead of offensive – certainty is a defender’s best friend. Yet, the AFL will plough ahead through the driest of fields, apparently having no idea of what actually makes the game tick – variety! Meanwhile, in a north eastern Adelaide suburb, every time the rain falls on a Saturday night, a young lad tucked up in bed will smile a mudlark’s smile. 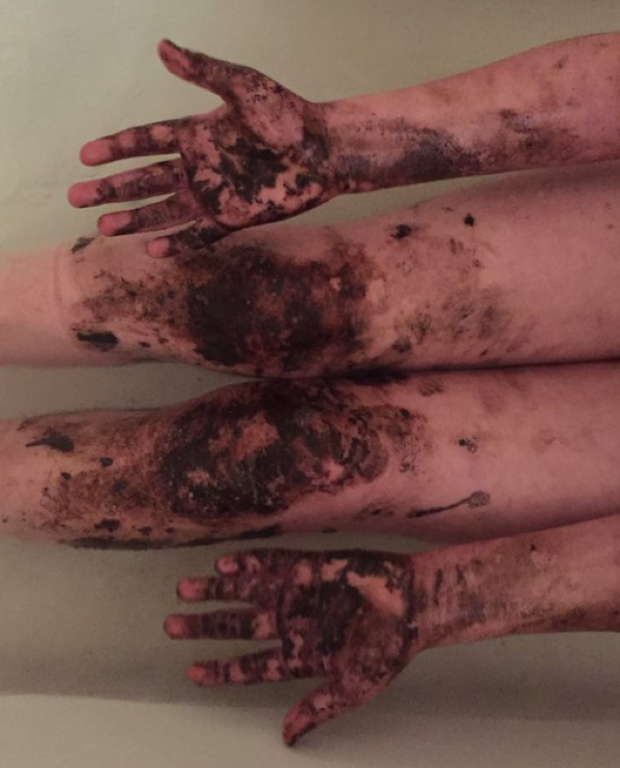 Read Barry Dickins on mud HERE. I only ever played there once, my last ever game of SAFA B Grade in 1981 (I preferred Ridley Road myself.) It was a bowling green compared to Athelstone the previous week where I was bogged shin deep in the sticky black centre wicket area. Back then, I sensed a deep whitegoods conspiracy jointly funded by Saverys and Godfreys – the grit that accumulated under the agitators of Adelaide ruined many a Simpson Pope twin tub. If you were lucky enough to make finals, the mud hardened significantly as the early spring warmth baked the crevasses such that the surface felt like baked razor blades. That wasn’t fun. The coach clearly has a good understanding of what best suits his team, looks like he’s praying for more rain. While the rest of Australia struggles with drought, WA has had successive wet winters. The weather comes in sudden violent squalls off the Indian Ocean, rather than the steady “setting in” rain of the eastern states. The volume of rain pools in sheets despite the draining properties of mostly sandy soils. Have been to WAFL games at Leederville and Bassendean recently with water a couple of inches deep and 30 yards wide (bring back Imperial measures I say; and Imperial Honours; and Imperious leaders) along one wing. I love the slides and spray from a good tackle in the pond. So long as I’m watching – and not having to play in it. Congrats to the lad. Persistence pays. Mum’s a looker. Great read Dave. Well done to you and the lad on a great season. Ahh, mud. I don’t recall the Barossa and Light grounds of my youth as being overly muddy although they all had their moments. Kingswood Oval- home of the Unley Jets probably the muddiest deck I experienced. Like Kapunda it had a reasonable slope running straight down the middle, but didn`t drain and became pig-sty thick and gluey. By late season it stank, especially across the cricket pitches. I was only thinking of the idealised, 190cm footballer recently. In 2040, or sooner, when the SANFL etc have been killed by the AFL, club recruiters will access databases (My Health opt-outs long gone) and identify the teenagers who`ll top out at 190cm and above and possess the right genetics etc to be manufactured into footballers. And that`s how it will happen. With all the romance and charm of Brave New World. Dave, I like your nod to the umpire and applaud his sensible, considerate and educational approach to the way he dealt with the kids in this game. Fancy that – the words ‘umpire’, ‘sensible’, ‘considerate’ and ‘educational’ all included in the same sentence! We do indeed live is an age of miracles. I remember seeing something like this in Adelaide in the early 70s. Across the road from where I boarded was the (then) winter-time quagmire of an oval of Concordia College in Highgate. The kids from St John’s Lutheran Primary School played their games there on a Saturday morning. The umpire was often that school’s Principal, Ophie Renner, no mean sportsman himself in his day, a middle-aged enthusiast who wanted the boys to enjoy the game, develop their skills and learn about the game. He was both umpire and on-field coach – to both teams! He’d talk to them, encourage them, congratulate good play, and, like the guy you mention, umpired with both his head and his heart. It’s what kids’ sport should be about. Thanks for the read and comments. Warm this week, Swish, so that mud may very well end up dangerous (have seen our oval like that in previous years). Suspect we’ll likely be visiting Ariana next year too once they’ve streamed the clubs. Thanks Mark, he delivers a good speech, our coach. Need a bit more Biscay clay over there, PB. There’s a real art to umpiring junior footy, Ian. The young lad we had in our most recent game was too afraid to blow his whistle. Never gave himself a chance to control the game. The lad is keen to become an umpire when he is old enough. I might do the course with him. I drove past Concordia on the weekend. The Adelaide Uni rugby ovals nearby were showing a fair amount of wear. Cheers, RB, it’s a big change from his first game in the wet. Refused to move. A great read, Dave the Magnet Mover.